People are being encouraged to host a SodaStream Fizz & Football House Party as part of SodaStream's advertising campaign during the Super Bowl. Use #SodaStreamParty and #BoycottSodaStream on Twitter to let people know all that is wrong with SodaStream. Also, make sure to submit your video for our 2013 Super Bowl SodaStream Spoof Ad Contest! A supporter sent us these lyrics and let us know we can share them with others who might be interested in using them. 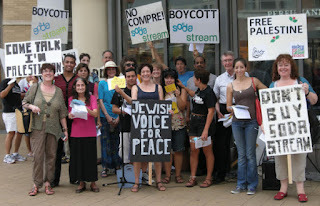 Check them out below and make sure to submit your videos to boycottsodastream@gmail.com! From our member group JVP-DC. Your product really makes me squeam. If what you’re doing were not perverse. It’s just so exploitive, I can’t take it. I wouldn’t be so awfully nettled. In hopes your factory won’t be busy. You wouldn’t find your product banned. Your sales might take an upward slant. To us is just an abomination.